The concept of “supply and demand” is a basic in economics. The rarer a commodity or resource is, the more it costs. The more abundant a resource or commodity is, the less it costs. Scarcity increases an items market value. Oil and Natural Gas, despite government subsidies and other efforts to the contrary, are still subject to basic economic laws. The more oil and natural gas on the market, the less the cost. If the price of oil or natural gas falls, this means less profit for those who sell it. The United States and Russia top the global oil and natural gas market. The US has just recently surpassed Russia as the top oil and natural gas producer. The price of natural gas is in great decline due to a new innovation. The practice of hydraulic fracking, recently introduced in the US as a means for extracting shale gas resources, has created a huge abundance of natural gas. The price of natural gas is going down, threatening global markets. In addition, oil is in over abundance. New African oil markets are also opening up. Oil and natural gas are non-renewable resources, yet the problem for the Wall Street bankers with names like Morgan and Rockfeller, is that there is too much of it. To keep the prices high, scarcity is a necessity. Russia, with its state owned natural gas company, is the top rival of the US in the natural gas market. The removal, or weakening of Russia within the world natural gas market is an economic necessity for the owners of US natural gas companies. The Soviet Union was once the primary rival of the United States. It led a block of countries, some led by Communists, others led by Independent Nationalists, who developed independently, and broke the economic chains of Wall Street and London. The events of 1991 devastated the USSR and Eastern Europe, causing a surge of poverty, chaos, and suffering. However, emerging from this chaos and suffering has been the nationalist government of Vladimir Putin. Russia has re-emerged from the crisis of the 90s, as an economic power. It is exporting oil and natural gas, and building an alliance with China, Venezuela, Cuba, and Iran. Putin’s recent visits to oil producing South American countries confirms the growing influence of Russia on global markets. The plan for a natural gas pipeline, connecting Russia and China, is also another blow to Wall Street. The rule of the capitalist market is “expand or die.” Wall Street’s influence is contracting, and its profits are shrinking. As the price of oil and natural gas declines, and more markets slip away toward China and Russia, the Wall Street monopolists are running out of options. In their desperation to stay on top, and keep their profits flowing in, they are doing their best to destroy economic rivals. Libya was once the top oil exporting country in Africa. It was led by Col. Moammar Gaddafi, who had taken power in a nationalist revolution. Gaddafi was far more sympathetic to China and Russia, and had a history of supporting armed revolts against the United States. Gaddafi had the used the proceeds of Libya’s oil exports to develop a strong domestic economy, with free healthcare and education for the population, as well as subsidized food and housing. This was all changed in 2011, when NATO bombs and US backed terrorist insurgents ripped the country to shreds. Oil exports in Libya are a mere 11% of what they once were. By removing Libya from the oil markets, a measure of temporary relief was created for the US oil capitalists. But it was only temporary. With the price of oil declining again, Syria is beginning targeted. Syria, another nationalist government that has been friendly to Russia and China, is facing a violent civil war by US backed insurgents. The talk of an oil pipeline from Iran to the Mediterranean is something Wall Street and London cannot tolerate. Hundreds of thousands of deaths, a refugees crisis, and other horrors are being unleashed to prevent a major blow to the profiteers. Now the US is once again engaged in Iraq. The US backed Kingdom of Saudi Arabia funnels money to ISIS terrorists, and now the US is bombing the country, supposedly to fight them. Iraq was beginning to re-emerge with record oil exports in June, the highest since the US toppled Saddam Hussein. The overthrow of the elected government of Ukraine, and the replacing of it with a fascist junta, was a direct attack, not just on Ukraine, but on Russia. The elected Ukrainian government was becoming friendlier to Russia. It was removed. Now, Ukraine’s natural gas is under the control of entities directly linked the family of Vice President Joe Biden. Ukraine, like Libya, Syria, and Iraq, is the scene of an intense civil war. Violence and chaos tend to halt economic activity. Despite Milton Friedman’s rhetoric about “market solutions”, Wall Street cannot allow any competitors. It does not try to defeat its competition by making better products or lowering its prices. Rather, it defeats is economic rivals with bullets, drones, cruise missiles, foreign backed insurgencies, and other forms of outright violence. The sanctions passed by the United States Congress against Russia are intended to lock Russia out of international markets. It is intended to prevent Russia from selling goods, and building up its rising domestic economy. Just like the violence unleashed in Ukraine, Libya, Syria, and Iraq, it is intended to clear the markets, create false scarcity, and allow US and British banks to remain as top economic players. The sanctions on Russia are not simply harming Russia’s economy, but also the economy of Germany, and other economic forces that do business with Russia. This is no problem was for the US bankers. While the economic attacks on Russia are justified with claims of ‘Russian Aggression’ this can be easily refuted by reality. 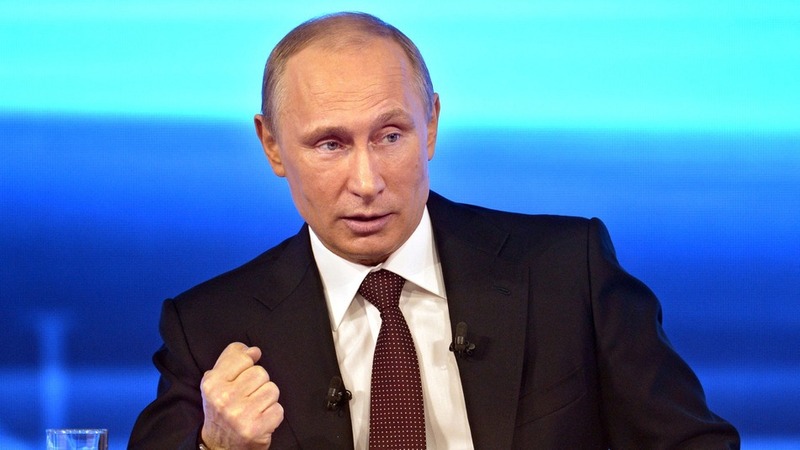 Any country that dares trade with Russia, is being subject to economic and political attack. Russia, which is emerging stronger each day on the world markets, is facing a campaign of violence in Syria, Libya, Iraq, and Ukraine, designed to push it off the world stage. 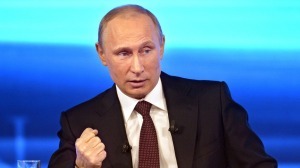 In order to survive economically, Russia will have to respond. It will have to take action. It will have to make the continued blows more costly to the attacker. If one continues to push on people, eventually someone will push back. The entire crisis has been staged by the West, and it could have catastrophic consequences.